The human life is considered most vital of all the living creatures on Earth because humans are bestowed with the highest level of cognition. One can enjoy life if the natural gift, the body, is in a good or healthy condition. A disease is an abnormal condition of the body resulting from infections, toxicity, unfavourable environmental conditions, or illness due to inherited genetic defects in the body. In the past, contagious diseases like the plague resulted in widespread death. About 100 years ago tuberculosis (TB), which is caused by a single bacteria, was one of the deadliest diseases. However, today even a fourth stage TB patient can live a normal life after receiving the allopathic treatment. Unfortunately, that is not the case with cancer. Today cancer is the most dreaded disease and the #1 killer worldwide. Unlike TB, cancer is difficult to treat as there are more than 100 different types of cancers. However, with a communal (research scientists, both in government and private organizations, government and private funding agencies) undying zeal and drive for finding a cure for cancer, a lot of progress has been made recently in treating different types of cancers, some of them resulting in total cure. Understanding Cancer At The Subcellular Level, delves into the root cause of cancer, which is the mutations in DNA molecules or genes. Further, it elaborates on the risk factors which cause mutations in genes. The internal causes are either inherited faulty genes from one of the parents or changes in genes due to the cell’s internal microenvironments. The external risk factors are many, such as age, alcohol, food, tobacco, etc. If your health is in a good condition, that means your genes are quite healthy. If DNA or genes are mutated, it leads to the development of diseases including cancer. Multiple mutations in a single gene and multiple mutated genes are needed to develop cancer. Today, with advancements in science and technology, it is possible to offer various treatment options to cancer patients. 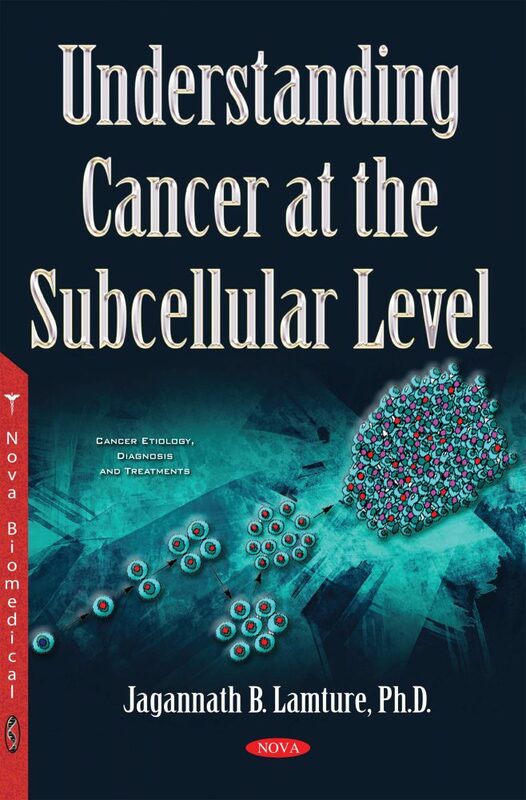 The book gives details about: i) signs and symptoms of cancer; ii) causes or risk factors of developing mutations in a healthy gene using the concept of molecular biology at the genetic level; iii) different types of genes and cancers; iv) country specific treatment options; v) estimated treatment costs and vi) dealing with cancer etc. The last chapter is dedicated to definitions of different terms used in this book. The information is compiled in such a way so that it is useful for scientists in many research laboratories (as oncology, basic drug development, chemistry, biochemistry, molecular biology and bio-engineering etc.) and all medical fraternity as doctors, nurses, technicians and most importantly cancer patients and their families and the people from all walks of life.